Girls night just got pretty darn nerdy. Tonight I spent the evening with the Mile High Seattle Study Club. Dr. Wendy Clark, a world renowned prosthodontist and speaker, lectured about Dentca digital dentures. Digital dentures are a great option for anyone who doesn’t have time for the typical 5-8 appointments required to make conventional dentures. Digital dentures take about three appointments, saving time and money. Another great feature is that if the dentures are ever misplaced or broken, a new set can be “printed” since the lab retains the digital impression. Isn’t technology amazing? 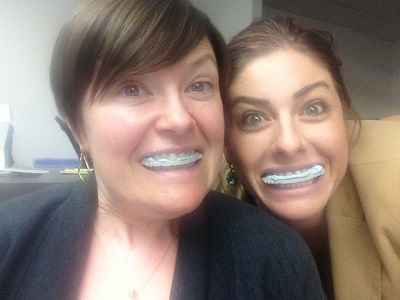 Here’s a pic of my favorite dental nerd, Dr. Chelsea Mayer, and I playing with the Dentca gothic arch tracing jigs. These are a great way to deprogram the jaw muscles to get an accurate bite registration.